Michigan’s 2015 recruiting picture continues to take shape this summer after the first weekend of the July live evaluation period. John Beilein spent time in Las Vegas tracking a number of 2015 targets including offerees Jalen Coleman and Eric Davis along with new targets Prince Ali, Kenny Williams and Shake Milton. 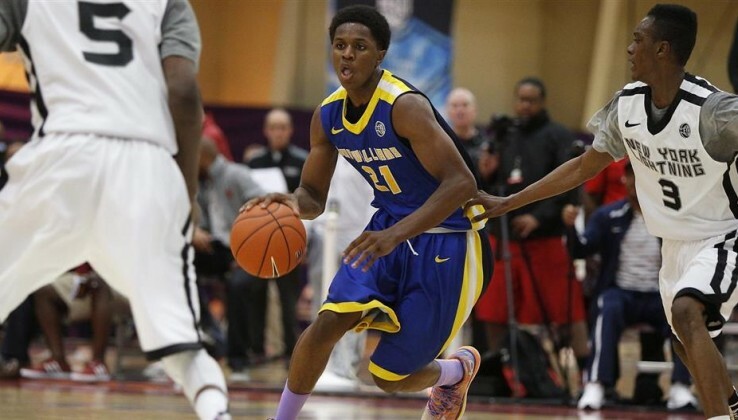 A four-star combo guard, Jalen Coleman has long been known for his shooting and scoring. At LBJ, he assumed point guard duties and looked pretty effective running a team. Playing off the ball as a scorer is still his specialty, but if he can run a team for stretches he becomes much more valuable. Notre Dame’s Mike Brey was watching closely and the Irish are heavily in the mix here along with others like Illinois, Michigan and UNLV. But Michigan’s recruiting board continues to grow as well and Florida guard Prince Ali appears to be steadily rising to the top of that list. Ali was spectacular at the LeBron James Skills Academy and added offers from Maryland, UCLA and Louisville. Michigan is still one of two schools recruiting Ali the hardest and he wants to visit Michigan this fall. “Right now it would be Louisville, UCLA, Michigan, Arizona and Indiana, no particular order,” Durham said. Kenny Williams also played well in Las Vegas and named Michigan as one of the five schools recruiting him the hardest along with Georgetown, VCU, UNC and Indiana. Williams plans to trim his list to five and set official visits after July. Josh Sharma visited Michigan with his Northfield Mount Hermon prep school team earlier this spring and could be considering a return trip, according to a report from Rivals.com. Sharma said they started off at Penn State before going to Ohio State, Xavier, Purdue, Notre Dame, Illinois, Marquette, Wisconsin and ended at Michigan. Figuring out which schools to officially visit. He used one of his five visits to go to Wisconsin this past January. Rivals.com ranks Sharma the No. 75 overall player in the nation in the class of 2015. Sharma has great athleticism for his size and college coaches like his down the road potential. He hopes to use the adidas Unrivaled camp to get better. Sharma attends the same prep school that produced Spike Albrecht and is one of the top big man targets on Michigan’s 2015 board. He’s one of the most skilled big men in the country with the instincts to utilize his talent as a face-up forward. He knocks down long-range jumpers with comfort and confidence and can drive the ball efficiently to the basket against opposing big men. His ability to see the floor and pass the ball is impressive at his age. Offers are flowing in as Florida, UCLA, Arizona, Arizona State, Texas, Michigan, San Diego state, Indiana and Cal have extended offers. Duke, Stanford, Michigan State and Louisville are showing interest. Matt Moyer added offers from Arizona State, Kansas State, Virginia Tech, Wake Forest and Penn State and Seth Towns added big offer from Iowa as the duo led the VCC Warriors to the Elevate Hoops Championship. It was Towns who led the way with 13 points in the win, though he had plenty of help from Malik Harris (11 points) and Moyer (nine points) in a low-scoring affair. Both Towns (Norland HS) and Moyer (Gahanna Lincoln) are 6-8 combo forwards with high-major offers already under their belts. Towns added one from Iowa to Michigan, Rice and more after the tournament, while Moyer isbeing chased by the likes of Virginia Tech, Wisconsin, Southern Cal, UNLV and more. It’s their versatility, length and ability to score from all three levels that had schools from all over the country following their games throughout the weekend at both Competitive Edge and Philadelphia University. Rivals.com raved about Moyer’s impressive play throughout the first week of the evaluation period. 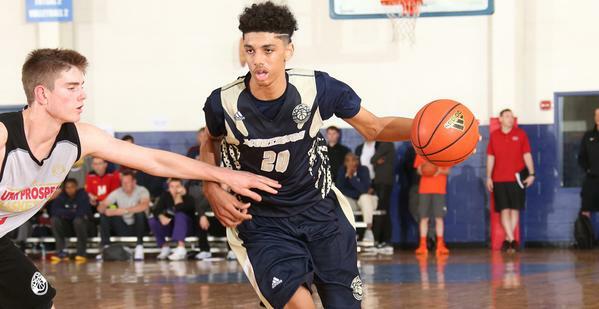 Putting 2016 forward Matthew Moyer into the top 100 for his class is looking to have been a wise decision. The 6-foot-7 forward simply has a knack for recognizing his matchup and attacking accordingly. If he draws a smaller defender he plays as a skilled four, with a bigger guy he goes to the wing. He can shoot, competes for rebounds at the rim and is a transition finisher. Moyer mentioned offers from Iowa, UNLV, USC, Dayton, Detroit, Xavier, Virginia Tech, Wisconsin, Butler and Air Force to go with interest from Michigan, Ohio State, Miami, Michigan State, Arizona and Arizona State. “Miami (FL) and Michigan,” Moyer said of the two schools that he would like to be offered from. While Moyer’s AAU teammate and best friend Towns received an offer from the Wolverines earlier in the summer, Moyer noted that he would like to play in a “high tempo” system that plays specifically to his strengths. 2015 wing Dillon Brooks has been linked to new Michigan interest. Matt Ryan committed to Notre Dame. Eric Davis was offered by Maryland. Derryck Thornton Jr. discussed his recruitment in this interview with Give-N-Go Basketball. John Beilein watched Tyus Battle on Sunday with his high school team. PJ Dozier played well and is now fully healthy, he remains on the Michigan radar.